Ever go on the neoboards and see someone's text that is colorful and just all-around beautiful? Did you think, "Wow, how did they do that?" Well, with this help page, I will teach you how to make your font that stunning. Those 2 textboxes is where we'll put the font code. A basic font code consists of key parts. The change words then activate the modification words, which in this case are "000000", "verdana", and "1". "[/font]" is a necessary part as well because it completes the font and tells it to stop. 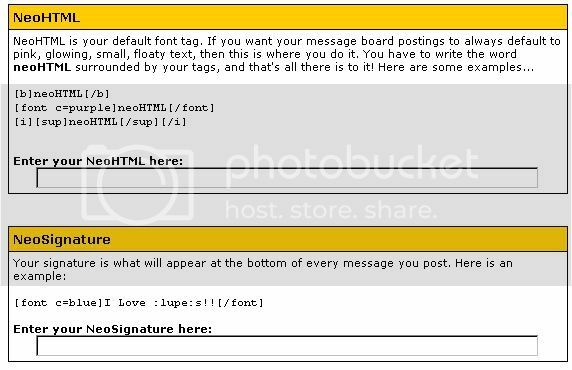 In this case, if you put this code in your neoHTML box, this is what your post would look like. This is where you get to have fun! The combinations of modification words are infinite. Let me explain further. My advice to you is to avoid eye-bleedingly bright colors. While you may think neon green is totally awesome, tone it down a bit so people aren't blinded by your font. Trust me, they'll be appreciative. So now you understand how color codes work. But how do you get exactly the right shade to match an avatar? Good question. Every fontmaker needs to know. This can be done a few different ways. Way 1: First, copy the avatar and paste it into an art program like Microsoft Paint. Then, with the eyedropper, select the color on the avatar you want to put in your font. Then, go directly to Color/Edit Colors and expand the window to define custom colors. If you are using Photoshop, double click the color palette and your hex code is right there. If you are using Paint, you will see amounts of Red, Green, and Blue. Enter those numbers into one of the top 2 websites mentioned above, and now you know the exact hex code for the color! Way 2: Download Get Color! and drag the eyedropper to anywhere on the screen. There are millions of font faces in the infinite world wide web. There's a couple of catches with neo's font faces, though. Number 1, The face has to be one word long. Number 2, If your computer doesn't have it downloaded on your computer, you won't see it on yours or other people's fonts. It will look like basic Times New Roman. Here are some examples of font faces you can use that most people own. One note, though: Please avoid fonts that are too difficult to read, like Parchment and Mistral. If it isn't outright easy to read, it's probably best not to use it at all. People shouldn't have to strain their eyes to read your posts. You'll find that these are the most popular fonts on the boards, mostly because they are easy to read, good-looking, and owned by virtually everyone: Verdana, Georgia, Arial. I like to stick with those font faces in size 1. Okay, this is fairly easy. Neo allows 4 sizes: 1, 2, 3, and 4. 1 is the smallest and 4 is the largest. Duh. With most fonts, I suggest sticking with size 1 or 2. I prefer size 1, but do what you want. It's your font. Just don't go overly big if you don't have to. There are some simple extra codes that you can also use. Want to combine a few? No problem. Getting rid of that dashed line in your posts known as a "siggy line" is fairly simple. Remember these things: [ and ]? These are brackets. Put an opening one at the very end of the NeoHTML box and leave it open. Then, put a closing one at the very start of the NeoSignature box. It will look weird in the preview, but it won't show up when you post. Sometimes it can really look cool to substitute certain symbols in place of letters. Here are some good substitutes to use. Try not to use symbols that can be confused for more than one letter. Symbols can be in one of two font groups. This means they will show up as boxes if it's not in an accepted font. If you have Firefox, though, all symbols will show up in any font. Firefox rocks, that's why. ;P Symbols in red are in group 1 and only work in arial, courier, or impact. Ones in blue won't work in Internet Explorer (and possibly other browsers besides Firefox), and because so many people use IE, use them with caution. UPDATE: Okay, neopets has now made lots of characters invalid. Supposedly, people were using them to spell swears or something. Whatever. Anyway, those will show up as question marks and taunt us all. You only get so much space for your font coding, and it's entirely too small. What a drag, right? Well, since TNT won't be changing that anytime soon, here are some tips to make your code shorter and keep your font looking the same. Tip 1: Delete default code. This also works if you only want one part left default and the rest of the font non-default. F=arial is totally omitted because your font will automatically become arial anyway. Tip 2: Remove the number signs. Yeah, I know, it's proper to put a number sign in front of a hex code, but in this case it doesn't matter. Something like "#850000" will be the same if it's just "850000". So, there you go: don't use number signs. Tip 3: The spacebar is not your friend. Don't use spaces! In all of my examples, I haven't, and you shouldn't either. Tip 4: One set of center tags. Because almost everyone gets rid of the siggy line, you can use just one set of center tags. Tip 5: Love the [p] tag. If you are using two [br] tags in a row, stop! You are wasting 5 of your precious characters. "[br][br]" should just be "[p]". Tip 6: One for the overlooked Times New Roman lovers. If you have ever typed in "times" or "timesnewroman" for your font face, you may have thought that it worked because that's what your face looked like. Technically, it didn't work. Times New Roman is 3 words, so it isn't recognized as a font face by Neopets. But, because it didn't recognize it as a font face, it automatically looks like your computer's default font - Times New Roman. Ta da. But what does that mean for you, the average Times New Roman lover? Well, think about it. You can type in anything for the font face that isn't really a font and get what you want. Even *one character*, which means you save a lot of space. Tip 7: Start and end in different boxes. A lot of people find this one confusing because it doesn't look right in the preview. Did you hear that? It doesn't look right in the preview, but it will look right when you post. Tip 8: Leave off the last digit of a hex code. This only works sometimes. If you have a color that ends in two of the same number or letter, you can delete one of them and the color will stay the same. Tip 9: Substitute a word for a hex. This only works sometimes. If you have a color that is similar to a word color that takes up less characters, use it. "A02828" is pretty similar to brown. Using brown instead uses one less character. Now that you understand the coding, get to work! Most fonts are completely centered and have at least 2 parts (including what your post will be) separated by a [br] or [p] tag. A lot of people make one part their name or nickname to personalize their posts. Try to be creative and make your font unique. The last thing the chat boards need is another over-used, generic kind of font. Need some ideas? Check out my other page, Puppy_princess231's Avatar Fonts to edit one of mine or get an idea of what looks good. Once you have a font made, you can go to one of the many font rating boards on the Avatar Chat to get others' opinions and suggestions. You may even get some fancy awards, wouldn't that be nice? Some raters can be very harsh or nasty, but don't make a big deal. Just thank them and leave or kindly ask for ways to improve. Also, most board starters make up rules, so try to follow them because some people are picky.